The RN to BSN program is composed of 180 quarter credits. Azure College will transfer a total of 76.5 credits from the student’s conferred Associate degree of Nursing. 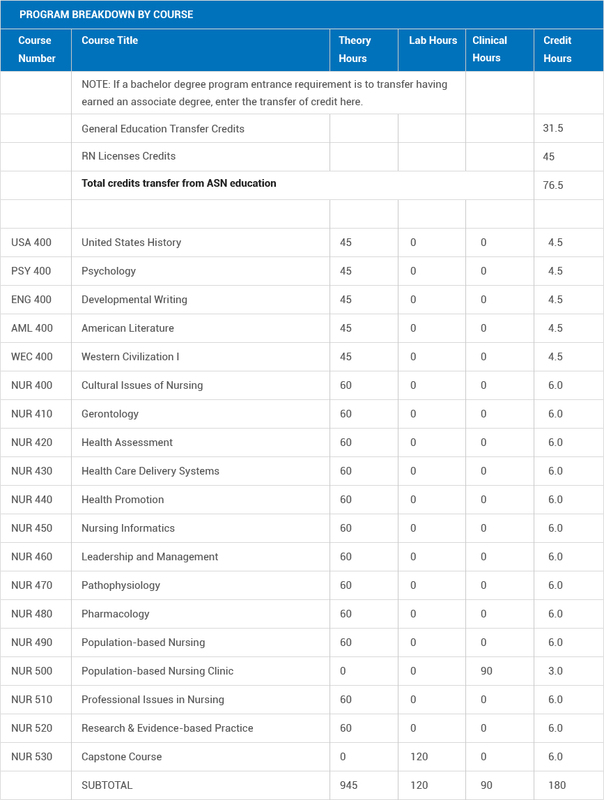 The 76.5 transfer credits are broken down as follows: The RN-BSN program requires a student to complete a total of 54 general education courses. The student will complete 22.5 general education courses during the program sequence and the remaining 31.5 will transfer from the Associate degree. The remaining 45 credits will be transferred based on the student’s RN licenses. Current, unrestricted license to practice as a registered nurse in USA (International applicants must validate credentials with an approved National Association of Credential Evaluation Services NACES agency) or an NCSBN-compact state. Student must provide proof of current CPR card and HIV/AIDS training. The College reserves the right to conditionally accept students into the program based on the following criterion. Student will have the duration of the program to provide a current, unrestricted license to practice as a registered nurse in USA (International applicants must validate credentials with an approved National Association of Credential Evaluation Services NACES agency) or an NCSBN-compact state before a diploma can be issued. The primary educational objective of the RN to BSN program is to increase the career and educational opportunities available to registered nurses in the Azure College’s service region. Graduates of the program will have a broader understanding of the nursing profession and will bring that understanding to the practice of nursing in their places of employment. Graduates will be prepared to assume some Leadership and management roles. Synthesize knowledge from the biological sciences, social sciences, behavioral sciences, humanities and nursing to provide appropriate culturally sensitive care to individuals, families and communities. Demonstrate effective interpersonal communication, collaboration with other professionals and leadership and management skills. Critically analyze and apply research findings to nursing practice related to disease prevention, health promotion, illness care and restoration of health. Utilize critical thinking skills to evaluate the outcomes of nursing care. Serve as client advocates by providing health education and in monitoring and promoting access to cost-effective care. Encourage lifelong learning and create a foundation for graduate study. Integrate professional values and ethical, moral and legal aspects of nursing into practice in a variety of structured and unstructured settings. The program can be completed in 54 weeks.